Some years back, I got into poll analysis for presidential elections and did well projecting the results of the 2000 and 2004 elections. I was dismayed but not surprised by the 2008 results, but I just plain got the 2012 election wrong, due to overestimating GOP voter loyalty. This year, it seems that both the GOP and Democrats have a loyalty problem. There are three new major polls out for the race for the White House, and they are similar in their message: The race is wide open at this point. and Economist/YouGov has Clinton ahead by 2 points. My point is not to argue which of these polls is the most likely to be accurate, or dig into them to find out what we already know about demographic preference, but what intrigues me, is that the three polls show between twelve and twenty percent of voters don’t support either candidate. Since third-party candidates historically garner a very small part of the popular vote (and Bernie Sanders has already thrown his support to Clinton), this detail implies that both Trump and Clinton are facing serious motivation issues within their party. 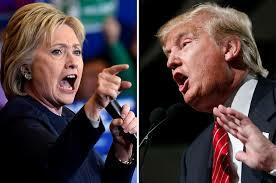 Polls consistently cite unfavorable impressions for both Trump and Clinton, and neither candidate has done much to mend their image, preferring instead to attack their opponent. National voter turnout has ranged from 36.0% of the Eligible Voter Population to 61.6% between 2000 and 2014 (between 54.2% and 61.6% in Presidential elections). This is vital to understanding the race. Bad weather, a late scandal for a front-runner, or emotionally-charged incidents right before the election could swing the decision in several key states. If either Trump or Clinton were to reinforce their base, either could significantly improve their position by then focusing on winning independents and undecideds.